Here are some more notable words from people I have encountered on my journey. As you cycle you become quite conscious of the cars that zoom around you. Even more so, you become conscious of the vast system that supports gas powered transportation. The roads, the big gas tanker trucks, the asphalt, the tires, the gas stations, the part shops, the drive throughs, the windshield wiper industry-- its trully immense. I suppose its all fairly obvious, but when you're biking long stretches this immense lattice of support becomes more and more lucid. The other day, I met a German cyclist. Our conversation gravitated to our mutual observations of our automobile infrastructure. He made a comment that I found memorable. "Every car has an invisible umbilical coard to Saudi Arabia. Cut that cord and every car becomes but a metal box without four seats." "Nothing is more complete than two chairs and a table"
On Denman island I stopped at a local artist's studio off the side of the highway. As I was looking at the vibrant and lyrical paintings on the wall, the artist walked over and enquired "You're an artist aren't you?" I had to laugh. It takes one to know one I suppose. She showed me her studio and more of her work. We had a wonderful conversation about the trade and her evident passion: tables and chairs. Paintings of chairs in particular abounded throughout her house/gallery. Her fascination rested in how a table and a chair perfectly compliment each other- aesthetically and conceptually-- to make a symbolic whole. In addition, they offer a rich range of shapes and silhouettes to explore. Here's a statement I could agree with! "But what about when you're starving?" One of the great pleasures of my journey has been meeting all sorts of interesting and fascinating people. I have mentioned a few encounters thus far, but there have been many more. I will share a few in the next entries. In the little logging community of Woss, I met a logger at the local restauraunt. 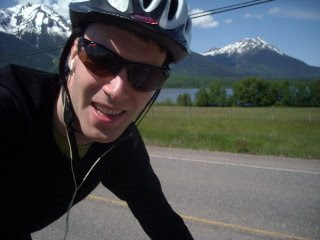 In a gruff sorta way, he was incredulous that I was biking from Smithers to Vancouver. "But where do you get the money do that?" I tried to explain about things going well, the universe being generous, divine light, etc... but before I could start, he interjected "But what about when you're starving?" He repeated this question several times. His question really stuck with me as I later sailed off down the road. I could just barely conceive of what he meant. I could feel how it was a question born out of a mindset that jarred with my own. I suppose it was the difference between being mindful of what you have rather than what you don't have. After having a fantastic meal of local halibut, a coffee refill, and feeling fully satisfied by a good morning's ride, starvation was the furthest thing from my mind. Rather the beautiful day, the nice waitress, the warm e-mails from my friends, the coming ride, all eclipsed any such anxieties. In a far corner of my mind I could see how drastic occurrences could lead me to be destitute on the side of the road in a day or two-- perhaps foraging for wild mushrooms or roots in the moss... But such shadowy contingencies were quickly overwhelmed by the brilliance of the wonderful day and meal that I was enjoying. I tried to assure him "But right now I am not starving! Right now everything is great. Its a grand day!" I don't know if he really heard me though. His parting words were, "Sure, today is good, but tomorrow will be better." Here I am. Where exactly, I am not exactly sure. Yesterday, I set out from Port MacNeil, on the Northern tip of Vancouver island. I had spent a luminous day with a fellow travelor of this highway and on life's road. The experience left me feeling blessed, lighter and renewed. I set off enthusiastically without downloading any maps, or surveying the distances ahead of me. I don't usually do this, but you see, I felt pretty good, and I have done this route before. Alas, I now recall, this particular stretch I did by car! A sore knee prevented me from cycling it, and I hitched a ride. It didn't seem too long by car-- maybe an hour or two. Of course, "an hour or two" by car can be a day or two by bike! Last night, for the last three hours I cycled, positive that I was just a turn away from a gas sation that I clearly remembered on the highway. Alas, I write this from a nice little rest area off the side of the road. I never made it! Exhausted at 9:30 PM, as the sun was doing down, I collapsed at a highway-side picnic table. Spent and resigned, I set up camp. I have no idea how close or far I am to anything civilized. As I hurtle through this uninhabited and wild land, I feel very small. I am a human powered speck moving slowly through the vast forests and mountains that engulf me like a massive hospital a newborn baby. However, as the eagles dance above me, I sense a change in the course of my journey. No longer am I moving away from something-- I am out of my familar Northern BC world. I am moving toward something now-- each pedal takes me closer and closer to the unknown. Each pedal away from the familiar, is a step into a world I know less and less about. To adjust I must let go of my expectations-- making it to the gas station I knew for instance--and embrace the mysterious and luminous blessings that only the unknown can bestow. My chance encounter with Ian the other day, and this riverside campsite being two wildly unanticipated, but eloquent examples. 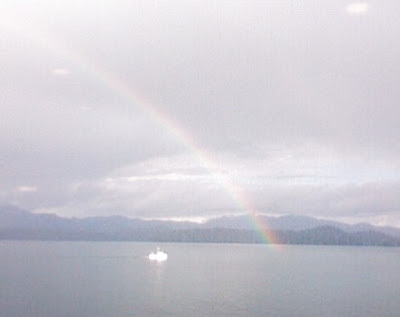 Yesterday, I took the ferry from Prince Rupert to Port Hardy. For those who have fortunate enough to have made the trip, you know that it is a long, languid and lovely 14 hr ride through spectacular seascapes, pods of jumping dolphins and cresting whales. If you're lucky enough to get a good seat amidst the flock of German tourists on the ferry, its also a wonderful time for reflection, reading and writing. I was able to get a little bit of all of these predicatable ferry experiences, and... a little bit more. To my great blessing, this little bit more consisted of some fabulous chiropractic advice. Yes, you read right. A chance meeting with a couple traveling by motorcycle, a message therapist and a chiropractor, led to a fascinating conversation. What exactly determines our postures? We delved into the fascinating relationship between one's belief system, personality, and life experiences and the way that they manifest themselves in our bodies. They shared fabulous examples of how modesty can lead to slouching, how repressive beliefs lead to stiffness in symbolic body areas and how life experiences be stored as pain and tension. Perhaps the most interesting, was how beliefs and values sculpt our posture. Excessive modesty, for example, can lead a tall person to slouch down to lower him or herself down to the level of others. Such "bowing down in humility" is an act symbolically ingrained in Judeo-Christian religion. It is part of the belief package. They spoke of how our society's beliefs and rituals are constantly pulling people's postures downwards. Such posturing comes with its energetic liabilities. The couple spoke eloquently about how stooped spines depress the flow of energy through the nervous system, effect our moods, personalities and inevitably our health and longevity. In the light of their enthusiasm it was all quite lucid. Posture and personality are so intimately linked it is hard to figure out which comes first. As I move forward on my cycling journey, let go of my attachments in Smithers, and embrace the unknown and my new artistic focus, it is my personality that I can feel straightening out and standing taller. Through this splendid encounter, my body is getting its chance to catch up and adjust accordingly. Or perhaps it the posture change that has started it all! Regardless, it feels good! 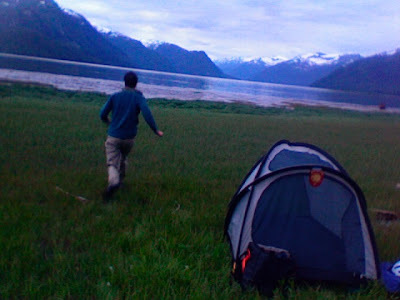 This morning I practiced walking my new evolving posture around my campsite-- if anyone in their RV was watching they would have had an entertaining show! There is something wonderful about departing a place by your own power. Each pedal, each little rock and each massive mountain that I pass on the side of road is one more pedal, one more rock and one more mountain away from Smithers. With each pedal being a raw physical act, the intention and meaning seeps deeper and deeper into my departure. The fact that it is all happening in slow motion-- it has taken me four or five days now-- to get to Prince Rupert, is also fantastic. It gives me not only time to reflect, but time to add the last layer of harmonious closure to my departure. And of course, it is also an opportunity to reflect on the new opportunities before me. As I move further away, the opportunities grow brighter and I catch myself pedaling a little faster. My pedal by pedal, slow motion departure is also a way to intimately say good bye to the land that has been my home for the last four or five years and where I grew up. 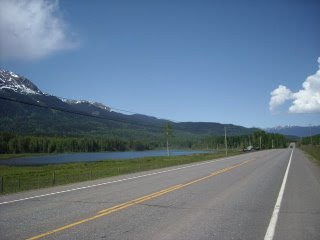 The highway that I am traveling, from Smithers to Prince Rupert, is rife with places that have meaning and memories for me-- side roads, campsites, towns, cafes, hotels, galleries, mountains, trails, signs, views, rocks-- you name it. As I pass them by, the memories come back. As I pedal by, I have a chance to turn them over like a beautiful stone picked up on the beach, and feel the emotions and the weight they come with. And... I have the chance to nod my head, push down on the pedals and move steadily on. 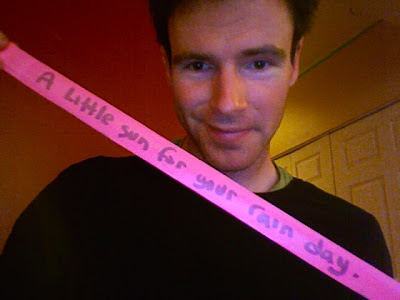 "A Little Sun for your Rain Day"
So said the message on the pink flagging tape, affixed to a Labatt's beer, waiting there for me, on the side on the highway. It has been a "rain day". I awoke to a marvelous pink sunrise above the mountain embraced field where I camped last night. However, I returned to sleep, only to be awoken by rain on my flyless tent. From there, things just got damper and grayer. Until, that is, at the top of a long hill, I spotted the pink tape. Wow. What a wonderful, wonderful gift! Some kind stranger turned a simple can of beer in a day-making, spirit raising, luminous blessing. Some sun for my day indeed! As I held up the can in wonder, the sun peaked through the clouds, and, I kid you not, a bald eagle swooped down from the trees and soared across the road ahead of me. I sit on the steps of a small chapel along the highway writting this-- the beer most gratefully in my hand. Off in the distance waterfalls cascade down the green and still snow speckled mountain tops. The mist rises from the river valley. The crows caw. Some birds chirp away. I smile. I sure hope their not doing police road checks today-- this beer is going along way! -- from Usk, on Hwy 16, revised at the Elephant's Ear cafe in Terrace. I am off on my journey. I am now rolling sublimely the spectacular Northern BC landscape, the mountains on one hand, the river on the other. I am flowing as smoothly as the river, and feeling as free as the blue sky. Leaving Smithers, I am overwhelmed by the the bountiful blessings I have received in my last month as I withdrew my four years of community roots. I have had so many well wishes, thank you's and blessings of every different sort. My last moments there have been very bright. From completing my mural and being wished off by all the nurses and staff, to selling virtually all my paintings, to getting hugs from little kids that I did workshops with. Appreciative purchases by friends and strangers is one thing, hearing from those who have received my paintings as gifts is even more fufilling. Its like a double purchase! It seems to have happened a few times this month. 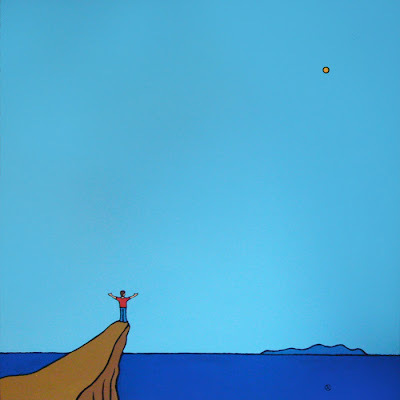 From being told by someone at the grocery store how happy someone was to get my painting to being suddenly hugged in the bank lineup by someone who couldn't contain their joy at getting one of my paintings the night before. It feels really good to developed an artistic style that has come to be both recognized and valued and filled with a certain community value. Just ridding my bike feels like ridding on blessings. I have reduced my possessions down to the absolute minimum, and most often these are one with a lot of personal meaning-- everything from my sweater (Thanks Gramma! ), the shoes Gabrielle bought me, the helmet my parents gave me, the book 'Courage' from my friend Amie, my tent-- which I traded with my friends Eric and Cynthia for a painting, my chair from my friend Andrew, my little notepad from my sister, organic tea from my friend Jenn, the coat of arms seal from my Dad, the coffee spoon from my mum, the cap from my cousin Brendan, the sleeping bag I got from my friend's store after they go one of my paintings. Last but not least, there is my bike which I am ridding, symbolically it is also a most provedential gift from a friend and the Universe. My bike was stolen a few weeks ago, the very day it so happens, that Gord was packing up his bike to ship to Vancouver. He ever so kindly is letting me ride it down for him-- and a wonderful ride it is. I am blissing out on the road. The wonderful day and the karmic overload of blessings is a sublime elixir. For many of you who have been following my epic and much prolonged departure saga, you can now exhale. Of course, if you were really holding your breath, your funeral has long passed! After an epic all night painting session, my Fall Mural at the Bulkley Lodge is now complete. I will post some photos of the completed piece shortly. I have become fascinated at just how much my art, my mural in this case, reflects my life. It took a friend to sit with me in front of the mural and point out what now seems blatantly obvious: The mural was very much about me and my life in the Bulkley Valley. Its almost as if my subconscious is sharing a fabulous series of insights with me on a 15 feet by 5 feet canvas! Indeed, to complete the mural, and to simultaneously complete my time in the valley is poetically apropos. After putting the paints away and washing the brushes, I literally walked out of the back door of the lodge, jumped on my bike and set out. One of the last symbols in the Fall mural that I added last night, was a V shaped flock of Canada Geese heading South. Well, the highway isn't pointed South yet, but that's the direction I go too. And my flight feels just as wonderously free.